An automatic alarm in the final two minutes of the Delta 4-Heavy rocket’s countdown early Saturday forced officials to delay blastoff with NASA’s Parker Solar Probe by 24 hours. 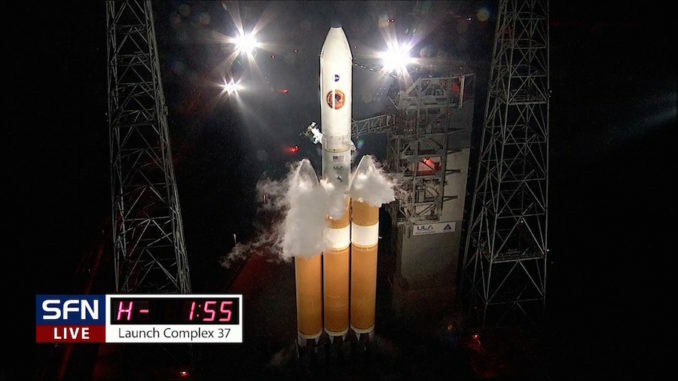 NASA and United Launch Alliance — the builder of the Delta 4-Heavy — rescheduled the launch of the $1.5 billion solar probe for 3:31 a.m. EDT (0731 GMT) Sunday, at the opening of a 65-minute window. Officials hope to dodge anvil clouds that could blow over the Cape Canaveral spaceport from offshore thunderstorms during Sunday’s early morning launch window. The official launch weather forecast from the U.S. Air Force’s 45th Weather Squadron predicts a 60 percent probability of acceptable conditions for launch Sunday. Scattered thunderstorms are forecast to move through Central Florida from the west Saturday afternoon, but the weather should improve in the evening hours. 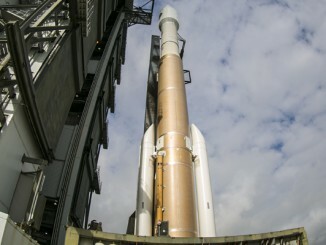 NASA and ULA officials intended to launch Parker Solar Probe on Saturday, but a series of unspecified technical issues — capped by an alarm at T-minus 1 minute, 55 seconds — kept the 233-foot-tall (71-meter) Delta 4-Heavy rocket on the ground. A problem early in the countdown caused a 20-minute delay from Saturday’s original launch time of 3:33 a.m. EDT (0733 GMT), then a data stream issue further delayed the Delta 4-Heavy’s takeoff time to 4:28 a.m. EDT (0828 GMT). The countdown picked up from a hold at T-minus 4 minutes, but a member of the launch team announced a gaseous helium regulator alarm at T-minus 1 minute, 55 seconds. There was not enough time remaining in the launch window Saturday to resolve the alarm, so launch managers declared a scrub for the day. 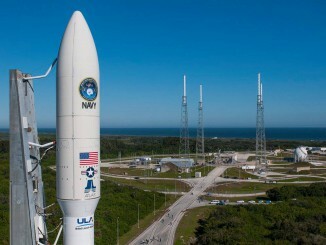 No other information about the gaseous helium system alarm, or the other technical concerns during the countdown, were released by NASA or ULA. Parker Solar Probe has until Aug. 23 to depart Earth and kick off a seven-year mission to fly through the sun’s atmosphere, making 24 orbits through the inner solar system and using the gravity of Venus to nudge ever-closer to our star. The compact, automated space probe will reach an orbit passing as close as 3.83 million miles (6.16 million kilometers) from the sun in 2024. The spacecraft carries instrumentation to measure the environment in the sun’s corona, the super-heated halo of plasma extending out from the solar surface, where temperatures reach millions of degrees. Scientists designed the mission to probe the corona for the first time, and study how the solar wind is generated and accelerated into the solar system. Parker Solar Probe will set records as the closest spacecraft to fly to the sun, and it will become the fastest human-made object in history, reaching a speed of roughly 430,000 mph — 120 miles per second or nearly 700,000 kilometers per hour — during its final perihelion passages in the mid-2020s. If the mission has not launched by Aug. 23, the liftoff will be delayed to May 2019, the next opportunity to take advantage of an alignment in the orbits of Earth and Venus to make the journey to the sun possible.